Missing my mother today, mai as we call her in Bhojpuri. Mai resides in Jamshedpur (part of erstwhile Bihar, now in Jharkhand) and even after much dissuasion she has not stopped performing chhatth puja though not in the best of her health for the last 3-4 years. She is now in her 70th year observing chhath at my brother’s place in Mumbai accompanied by my mama & mami (vratin herself) traveled all the way from Patna to perform the rituals together. This is the story of mai‘s chhatth puja observance meant primarily for those who are not aware of this festival. I can believe that. This is an extreme display of religious fervor of the devout. Let me tell you how “extreme” is extreme. 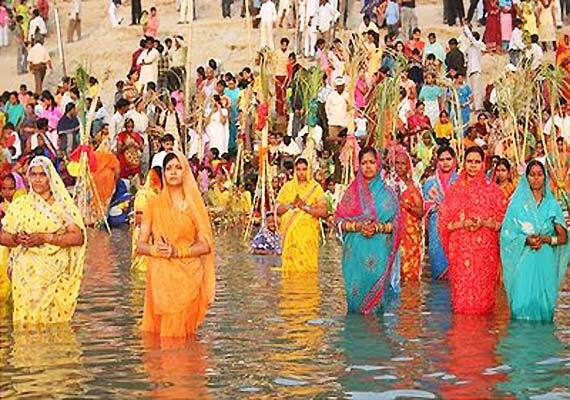 3rd day from Deepawali is observed as holy bathing (नहा-खा), the main worshipers, called Parvaitin takes a holy bath early morning and then eats rice, gram pulses and pumpkin vegetables. After eating in the night the parvatin starts the fast (व्रत). The next day fast is observed whole day without water till late evening when the prasad is prepared. This day is called “Kharna”. I still remember mai coughing away over the smoky chulha on the day of the “kharna” as she tried to stoke the chulha in the pooja room cooking her repast of Roti and rasiyao (Kheer). First the Vratin eats the prasad and then it is distributed among all family and friends. This day the festival preparations would simultaneously start. There was “daura” (basket) and “soop” (sieve) to be bought. Copious amounts of fruits to be obtained, the chief among them being an entire bunch of small yellow bananas (“ghawadh” of bananas as the bunch was called). Sticks of sugar-cane. Coconuts in their casings. And lots of other items of pooja requirements. And the separately and freshly ground “atta” (wheat flour) to make the main pooja ofering of “thekua“, kilos and kilos of it. Drenched in ghee. And the largish round red fluffy paper stickers which adorned the doorway to the family pooja room which was the hot-bed of all activities for the chhatth puja. After this the rigorous fast starts for next 36 hours. Come the day of the arghya to the setting sun all the pooja samaan and the prasad was piled onto the daura and we would all march in a procession (family, friends and neighbors to the river nearby. The lead ‘walker’ who was the cynosure of all eyes was the person carrying the daura on his head. This “position” was open each year and several people would vie to do the service. Mai walked a little behind the daura-bearer with an amazingly sprightly walk despite the hours of fasting. Some of us kids would walk with either the sugar-cane sticks or the banana bunch. What sticks to my mind even now, and still manages to bring a lump to my throat was the soulful rendition of the favourite chhatth song: “Kaanchahin baansa key bahangiya, bahangi lachakat jai. Poochha na Suraja Ram ke kanhariya, daura ghaatey pahunchay….” Sung by mai and accompanying women. There was one more which I do not quite remember, “Khetwa key aari, aari…..“. As we neared the river ghat several other groups of women would coalesce and join together for an even more throaty rendition of the song or some other chhath songs. Mai’s voice always sounded the strongest and as mellifluous as ever! At the ghat the mingled crowds would split into their own groups and occupy their own patches of the sand-bed. This patch would be zealoulsy marked out by the jetsam and flotsam which we would collect (even as the pooja proceeded for the setting sun) to be able to occupy the same spot for the next morning’s rituals. The evening poojaitself comprised of mai stepping into the water knee-deep with Pitaji helping her to offer the arghya to the setting sun. She would go round-and-round with the multi-decker soops she held on her hands. Time to trudge back home on our wearied feet after these rituals. Mai would show no signs of discomfort, at all. The major concern for all the kids at home and neighbourhood was how to wake up early in the morning for the morning arghya! Parents and elders promised that they would wake us up well in time but we were never sure if they would keep their words. We would lie down on our beds pledging not to sleep lest we miss the morning arghya as we were certain that the elders would ditch us. But sleep we did! And, miraculously, we would wake up just in time to join the morning procession to the river ghat to offer the morning’s arghya to the rising sun. The daura, sugar-cane, singing etc etc. would resume much before dawn. Back to the ghat for the morning arghya. Occasionally there were small altercations among the younger people from different families disputing the exact location of the previous evening’s spot for their families. But these were solved with some prompt intervention from the elders. Yes, crackers saved from Diwali celebrations from just a week ago would be burst just as the dawn broke. Some images which remains in my mind are the shooting rockets against the dull, dark pre-dawn sky and the hilarious locus of the zameen-chakkar on the sand bank. We were never quite sure where this would land up! After the morning arghya, the fasting for mai ended with Pitaji giving her ginger, lemon and water. Prasad is then distributed to all. Normally the prasad is “Thekua”, fruits, and among all and my favorite the sugar canes. Once a family starts performing Chhatt Puja, it is their duty to perform it every year and to pass it on to the following generations. The festival is skipped only if there happens to be a death in the family that year. Although it is observed most elaborately in Bihar, Jharkhand, Eastern UP and the Terai regions of Nepal in modern times, and is more prevalent in areas where migrants from those areas have a presence.